By all accounts (Arizona Phil), Little had a good spring in Mesa. Just a week ago, Little pitched five innings and did well. He allowed 1 run but had 6 Ks in the outing. I was was not expecting to see anything from Little in his South Bend debut except his curve. Considering he did not pitch D1 baseball, but rather at a junior college, the Midwest League is a pretty big jump in talent. I was trying to temper my expectations and think long term with his development rather than get immediate results. I did not want to place unreasonable expectations on a first round pick. Then again, I hoped to see his fastball in the low to mid-low 90s (91-93) and that he could command it often. If he could get through the fifth with just giving up 2 or 3 runs, I could have lived with that. Maybe he could get in 60-80 pitches for the night and strike out four or five. But those are just wishes and maybe unreasonable ones at that. My wishes are where I want him to be by the end of the year. Tuesday was the first step to get there – or that’s what I told myself yesterday afternoon. Little got the first two guys out on 5 pitches. He looked good at that point. He was throwing nothing but fastballs around 92, which was 3-4 mph better than at Eugene last year. Then Little fell behind the third batter. It went to a full count when the batter laced a double down the left field line. After a passed ball, he walked Bowling Green’s cleanup hitter Brendan McKay. At this point, I began to wonder why Little was nibbling on every pitch instead of attacking the zone. He looked to be in command with batter #5 when strike three was not caught by catcher Miguel Amaya, who then was unable to make a throw to first for the third out. 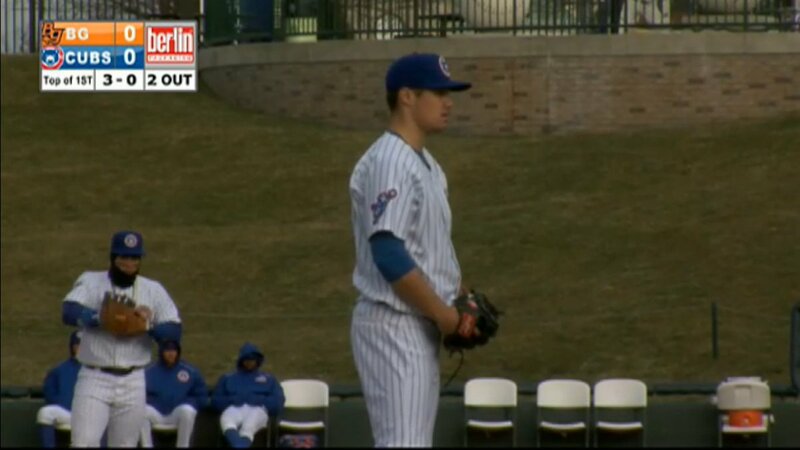 Little was closing in on 30 pitches, which is usually the inning limit for Cubs in South Bend. It looked like Little was going to get out of the inning on a liner to center but the ball kept sailing resulting in a 2 run double. Little faced one more batter who promptly walked. After 35 pitches and 0.2 IP, Little was done – 1 K, 2 BBs, 2 hits, and 4 ERs. A line I have been saying a lot lately is “I have seen this movie before.” After watching Little go at it last night, I said it again. This looked somewhat similar to how he pitched at Eugene last year. But then again it wasn’t. The velocity was up this year, he threw a couple of changeups that looked good, the curve looked nice, but his fastball was all over the place. He has to attack the zone rather than pitch on the edges. He has to get that straightened out. At 21-years-old, he’s got time. If he figures it out, he could be special. But for now, it is hard to see that. Still, I look forward to his second start and see how he does then. It’s a process, but no one said it would be easy, even for a first round pick. The rest of the game was a doozy! Bowling Green took an 8-0 lead after an inning and a half. Then, South Bend began to chip away at the Hot Rods’ lead. Home runs by Michael Cruz, Austin Filiere, and Jared Young pulled the young Cubs close to 11-9. Chris Carrier, an outfielder from Memphis, stepped up to the plate in the seventh and proceeded to hit a grand slam to give South Bend a 13-11 lead! Brian Glowicki held the Hot Rods scoreless to preserve the win.